How much bacteria is on a child's hand after playing outside? Behold some of the bacteria that grew when a boy who had been playing outside pressed his hand onto a Petri dish. Springtime is play-in-the-dirt time, and if you or your kids ever needed more motivation to wash your hands afterwards, this germy, colorful creation ought to do it. 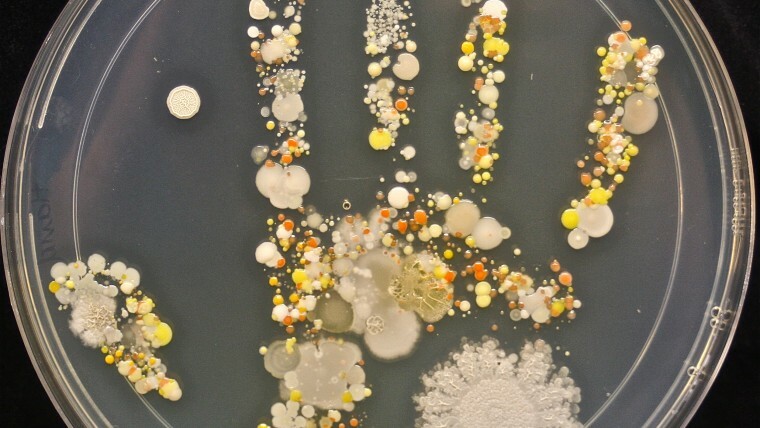 Behold some of the bacteria that grew when an 8-year-old boy who had been playing outside pressed his hand onto a large Petri dish. The photo received lots of buzz after his mom posted it on Microbe World. Tasha Sturm, who worked as a microbiology lab tech at Cabrillo College in Aptos, California, was used to seeing students swab objects like cell phones and door knobs for germs as part of basic experiments. “It’s partly to show that there are microbes everywhere,” Sturm told TODAY in 2015, noting her two kids enjoyed replicating some of the tests at home and that her son had been particularly interested in checking out what was on his hands. In the spring of 2015, when he was getting ready for school, Sturm asked him to play outside and pet the family dog. When the boy came back in, she had an agar plate — a sterile Petri dish filled with a substance used to grow bacteria — ready. After he gently put his hand onto the plate, Sturm incubated the dish at body temperature for a day or so and then let it sit out at room temperature. By the time she took the photo, the bacteria had been growing for about a week. Her son’s reaction to the results? “He said, ‘that’s cool.’ And then my daughter said, 'Let’s do the dog’s nose, let’s do the paw, let’s do the cat’s tail,'” Sturm recalled. Sturm believed the large white circle in the bottom right of the photo was Bacillus, which is commonly found in dirt. Some of the other white spots may be staph, or Staphylococcus, she said, while the yellow and orange spots may be yeast. Both of Sturm’s kids knew that if they wanted to pet the dog or play outside, they needed to wash their hands before eating. It’s just basic hygiene, she said.